Santa Fe County officials are working on a new or revised ordinance regulating drilling for gas and oil within county boundaries— and some residents are worried. When a drilling proposal from Houston-based Tecton Energy first surfaced last year, the county's legal experts took a close look at the county's current mining ordinance and decided to work up some changes. The existing ordinance, which was adopted in 1993 during controversy over a leach gold-mining proposal in the Ortiz Mountains, lumps oil and gas together with mining and other extractive industries and imposes numerous requirements on placement, water management and review and maintenance of mining and drilling operations. But Stephen Ross, the county's attorney, said it makes more sense to separate out oil and gas drilling. "Regulating them as the same (as mining) wasn't effective," Ross said. "We're thinking it will be a separate ordinance." Ross declined to elaborate on what might be included in the new ordinance since it's still a work in progress. He did say the county is using ordinances from other gas and oil producing areas as models. But the lack of details has some residents in the Galisteo Basin— where Tecton wants to drill at least eight exploratory wells— feeling nervous. Is The Mortgage Mayhem Turning The Land of Enchantment into the Land of Entrapment? Few of these articles have been by local reporters and those that were by local press, covered the story from the angle of investors in the stock market or prospective home buyers, leaving the most pressing questions not just unanswered, but unasked; How many New Mexicans are in default on their mortgages, why and what can they do? Santa Fe County has 76 properties listed in Pre-foreclosure, 2 properties in Auction and 57 Properties as Bank owned. Bernalillo County has 529 properties in Pre-Foreclosure, 182 in Auction and 806 Bank owned. Chaves County has 47 Pre-Foreclosures, 2 properties in Auction and 61 properties Bank owned. Cibola County has 7 pre-foreclosures and 1 property in auction. Curry County has 4 properties listed in Pre-foreclosure. Sandoval County has 141 properties in Pre-Foreclosure, 12 properties in auction and 73 properties Bank owned. Valencia County has 86 properties in Pre-Foreclosure, 16 properties in auction and 111 Bank owned. My story in today's New Mexican about state cabinet officials contributing to Gov. Bill Richardson's presidential campaign can be found HERE. I should have plugged this several days ago, but The New Mexican has launched a Richardson web site for news on his campaign. (Blogger Heath Haussamen wrote 20-some background pieces for it. )You can find The Richardson File HERE. It seems like a simple cause and effect. Six thousand National Guard soldiers descend on the U.S.-Mexican border and apprehensions of undocumented immigrants drop by 27 percent in a year. But economists say look further. Thirty-one states, but not Kentucky or Indiana, have agreed to participate in a voluntary program that allows uniform tracking of greenhouse gas emissions. An architect who has pleaded guilty to federal charges for his role in the Bernalillo County Metro Court scandal might lose his license. The Albuquerque Tribune is reporting that the New Mexico Board of Examiners for Architects has issued a notice of possible action against Marc Schiff for violating the code of conduct and other issues. The board says it could suspend or revoke Schiff’s license, fine him and notify a national licensing organization, the Tribune reported. You can read Schiff’s plea agreement in the case by clicking here. Led by California, 31 states representing more than 70% of the U.S. population announced Tuesday that they would measure and jointly track greenhouse gas emissions by major industries. Two states leading a revolt against the Real ID Act have picked up new firepower in the U.S. Senate in their fight to roll back an unprecedented federal overhaul of state driver's licenses. MCCONNELL AIR FORCE BASE, Kan., May 9 -- President Bush would veto the new Iraq spending bill being developed by House Democrats because it includes unacceptable language restricting funding, White House press secretary Tony Snow said Wednesday morning. The head of the U.S. Education Department's student loan office announced her resignation yesterday amid mounting criticism of the agency's oversight of the loan industry. An aide to Sen. Christopher S. Bond (R-Mo.) urged the White House to replace the U.S. attorney in Kansas City, Mo., months before Todd P. Graves's name was included on a Justice Department list of federal prosecutors the Bush administration was thinking of pushing out of their jobs. The global war on terror, as President Bush calls the fighting in Iraq and Afghanistan and related military operations, is about to become the second-most-expensive conflict in U.S. history, after World War II. The Justice Department cleared the way yesterday for a limited immunity deal between House investigators and Monica M. Goodling, a former top Justice aide who has refused to answer questions about her role in last year's firing of eight U.S. attorneys. RICHMOND, May 7 -- Virginia is preparing to impose a law designed to stop out-of-state politicians from funneling unlimited amounts of money through the commonwealth, which has no restrictions on how much individuals or businesses can donate. County election officials statewide are braced for trouble next week because a new state database has not provided updated voter rolls for many polling places, and early voting begins Monday for the May 12 election. Counties statewide have been struggling with the Texas Elections Administration Management system, or TEAM, since the state required them to switch to the system this year. Smaller counties are particularly affected because the Web-based TEAM system has not provided some of the updated voter registration lists that counties normally distribute to every voting location, according to Scott Haywood, spokesman for Secretary of State Roger Williams' office. Starting Monday, the polls open early only in Richmond as part of an exclusive pilot program that uses vote centers to collect ballots, a dramatic departure from the traditional precinct system used in years passed. "I think this will speed up the traffic more," said Josephine Burdette, who will be a greeter at one of the voter centers next week. That's because vote centers offer more choices to voters, including multiple voting days and more locations to vote. The four voting centers in Wayne County replace 31 precinct polling places in past elections. But where voters had to cast past ballots at their neighborhood precinct location -- a confusing proposition in itself for many -- they may now go to any of the four centers to vote. HART'S LOCATION, N.H. -- The champagne is on ice at the Notchland Inn on Route 302. Proprietors and longtime partners Ed and Les are ready to raise their glasses to New Hampshire later today, when the state is set to pass a broad civil union bill granting gay and lesbian couples virtually all the same legal rights as married heterosexuals. Who's most skeptical of the Democratic Party? People under the age of 34. The belief that government can help solve problems facing our communities is what has always separated Democrats from Republicans. However, the rise of the unaffiliated voter shows that a growing number of New Mexicans are questioning whether the Democratic Party of New Mexico still stands for progress when it comes to solving the challenges facing communities today. Of the 150,000 people who registered and voted in 2004, 56% were between 18 and 34. But when it came to choosing party affiliation, 30% of young voters chose to register without designating a party affiliation. 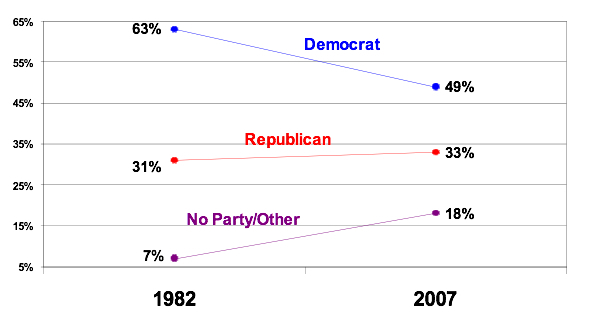 It isn't that more voters are joining the Republican party, it's that they're choosing not to join the Democratic Party. New Mexico is a closed primary state. 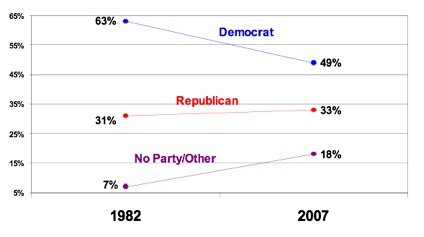 Voters who choose not to have a party affiliation choose to be disenfranchised in primary elections. More and more voters are choosing no party instead of our party. We have to ask why? Is the rise of the independent voter in fact a vote of no-confidence in the Democratic Party of New Mexico? The Democratic Party of New Mexico is no longer the party of the Majority in New Mexico. The question is whether we want to do something about it. Next: Why Democrats lost the 2004 Presidential election in New Mexico. In 2008, New Mexico will again be a battleground state. And with Pete Domenic, Heather WIlson and Steve Pearce seeking re-election, Democrats in New Mexico have an unprecedented opportunity to send a second wave of Democrats to Washington to continue the fight against corruption, incompetence and cronyism that's robbed even our returning soldiers of the quality care and respect they're sacrifices deserve. With so much at stake, we, the candidates for state party chair, owe it to our newly elected State Central Committee Members every opportunity to learn about our plans when it comes to blazing a path to victory wide enough for all Democratic Candidates. Let's answer questions, let's have exchanges, let's converse, let's get it all out in the open and let's give Democrats a real debate so they can make a real decision on April 28th.